I've worked with it. I took three putts and hit the first one about 3 inches fat. The second one, I hit it; and I hit the third 15 inches fat. That was it. I could only hit balls thrown down at my feet. We tournament golfers are much overrated. We get paid to much. [Isao Aoki] is one of the three best players in the world from 100yards. Maybe the best. If a course needs to be in great condition to be played effectively,then the design strategy is flawed. New Updates! (4/24/2019) We've been working really hard on completing our membership system so you can submit quotes and keep track of them. Once this is complete in the coming weeks there will be a lot more quotes by Tom Watson and other authors. We've also changed the sorting on the site so you now see the latest Tom Watson quotes first. 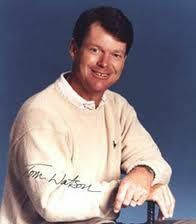 Our goal is to have the best Tom Watson quotes on the web!